Two of our favorite words in the world. 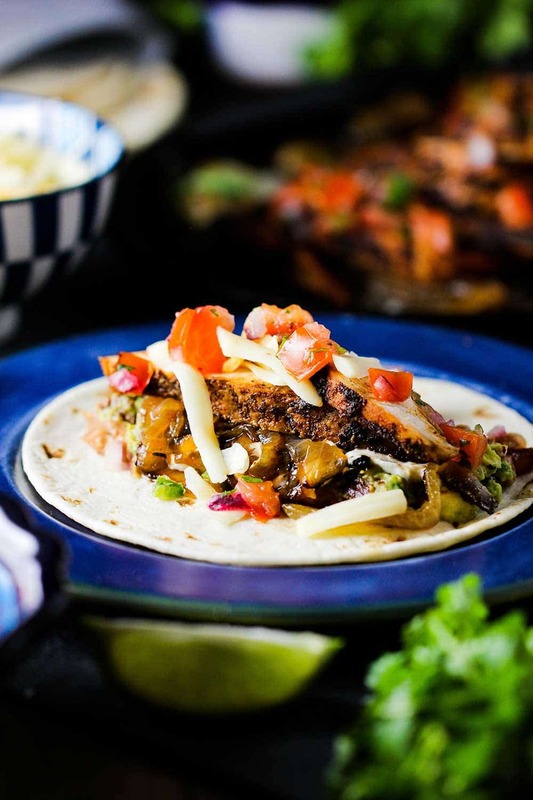 Fajitas have become a fixture in Tex-Mex cuisine. And for good reason. These fajitas, with all the fixings, are truly as good as they come. 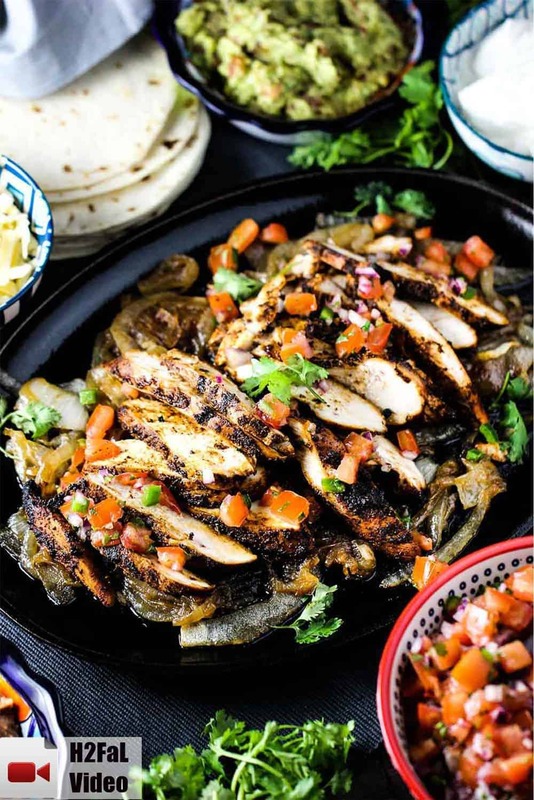 These chicken fajitas are perfect for a family meal, or double the recipe for a party. 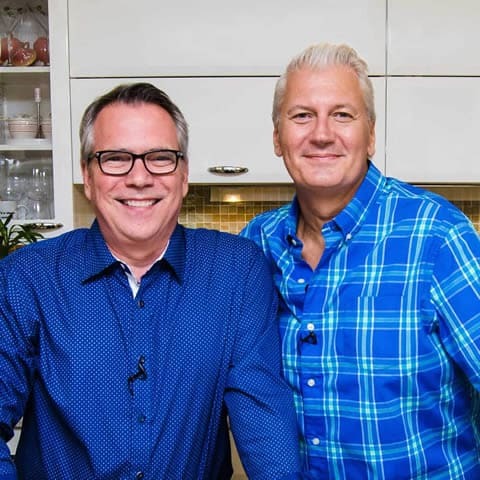 Watch us show you how easy it is to make these incredible Chicken Fajitas at home! 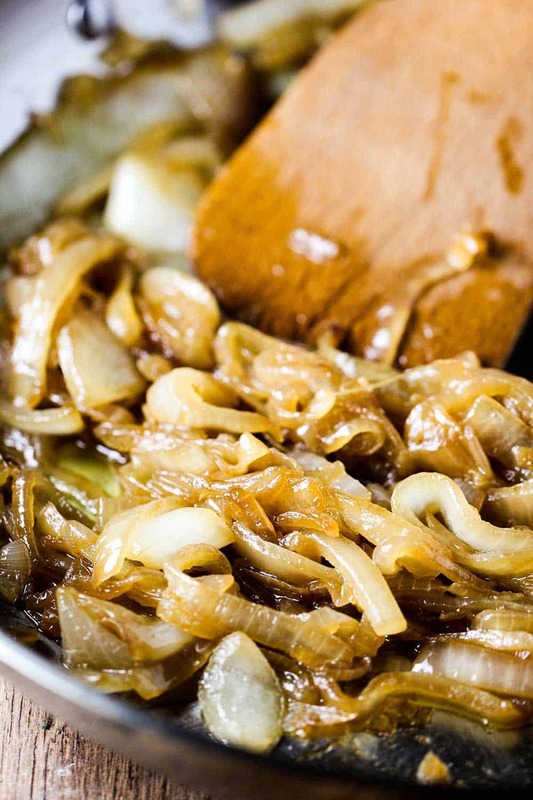 A simple marinade of white wine, Worcestershire sauce, lime juice and soy sauce locks in the flavor. We place the boneless, skinless chicken breasts in a baggie with the marinade. 2 hours, or even better, overnight, in the fridge is perfect for marinating the chicken. After the chicken has been removed from the marinade, we place the pieces in a large baking dish or pan. 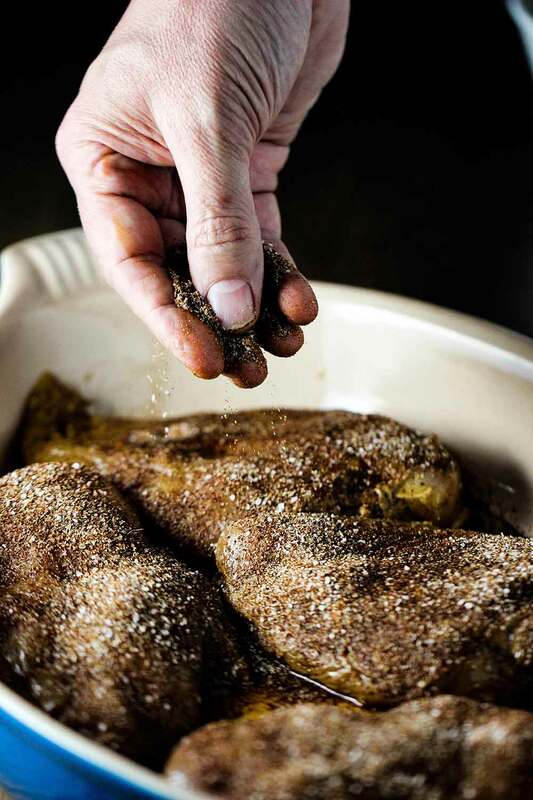 Use your fingers to sprinkle on the rub. The spices in the rub are similar to blackening, but the flavors are not too intense. Crispy on the outside and juicy on the inside. While the meat is marinating, it’s a good time to get the onions going. We like to cook them until they just begin to caramelize. 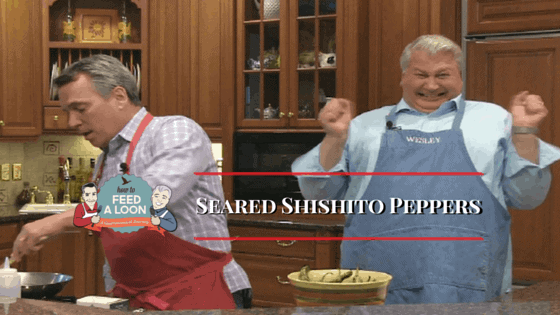 You can add strips of green, red, and yellow bell peppers for flavor and color, too. 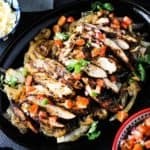 We think grilling the seasoned chicken pieces on a hot grill is perfect for chicken fajitas, but you can also cook in a large, sturdy, hot skillet. Grill (or sauté) until browned on the outside (it’s okay if it chars a little, it’s supposed to do that) and nice and juicy on the inside. You’ll want the inside temperature of the meat to be at around 155°F to 160°F. The meat will continue to cook as it rests for about 5 minutes after grilling/sautéing. 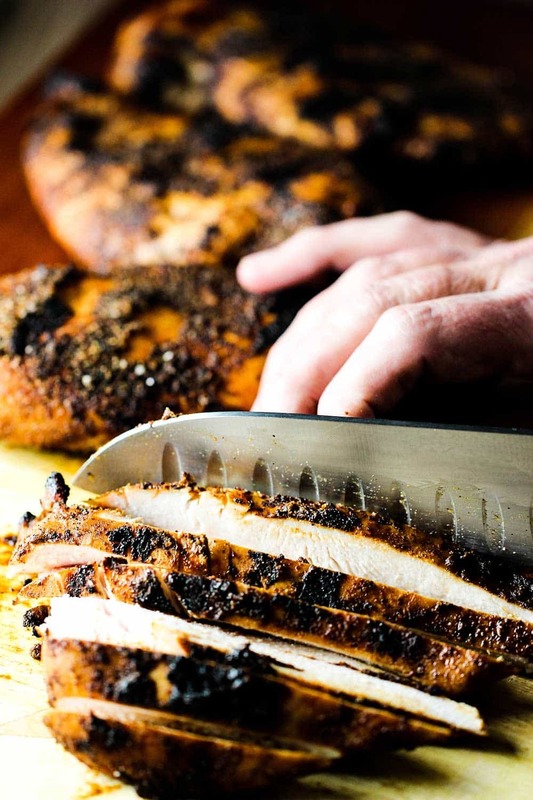 After the chicken has rested for about 5 minutes, use a sharp knife to carefully cut the chicken on a diagonal, across the grain. At this point, you’ll want to make sure you’ve got your fajita pan over high heat. And get your onions heated up and all the fixings ready to go. Once the fajita pan is piping hot, add the onions, and then the sliced chicken. Then, it’s time to build yourself the best Chicken Fajita you’ve ever had. We’re not kidding when we tell you these Chicken Fajitas are…amazing. Just wait for that first bite. Wait until you hear the reactions of friends and family taking their first bite. Amazing Chicken Fajitas. A handful of beautiful, delicious and unforgettable yumminess. Amazing Chicken Fajitas are truly that...amazing. 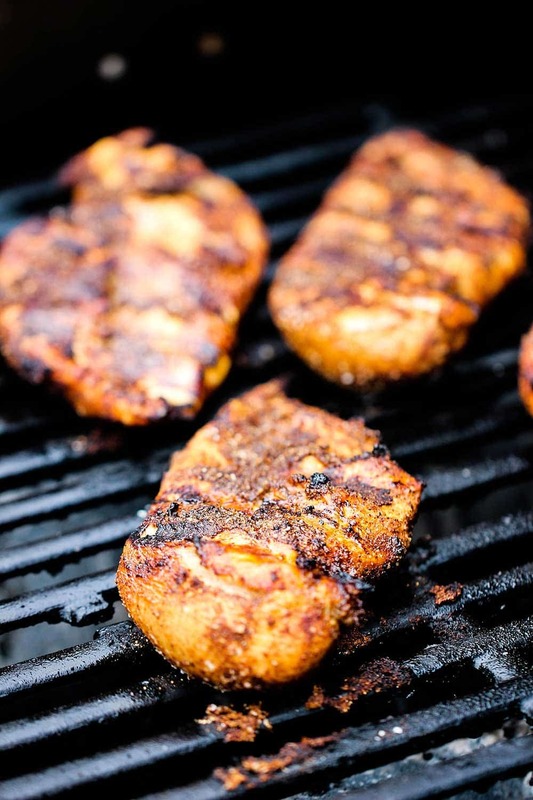 As the chicken grills, the chicken becomes slightly blackened, locking in flavor and making the meat so tender. The caramelized onions put them over the top. Be sure to make the best-ever guacamole and fresh pico de gallo, and you will be in fajita heaven! In a small bowl, combine the rub ingredients and mix together with a fork. Set aside. Make a marinade by whisking together the white wine, lime juice, soy sauce and Worcestershire sauce. Place the chicken in a large zipper baggie, or a shallow baking vessel. 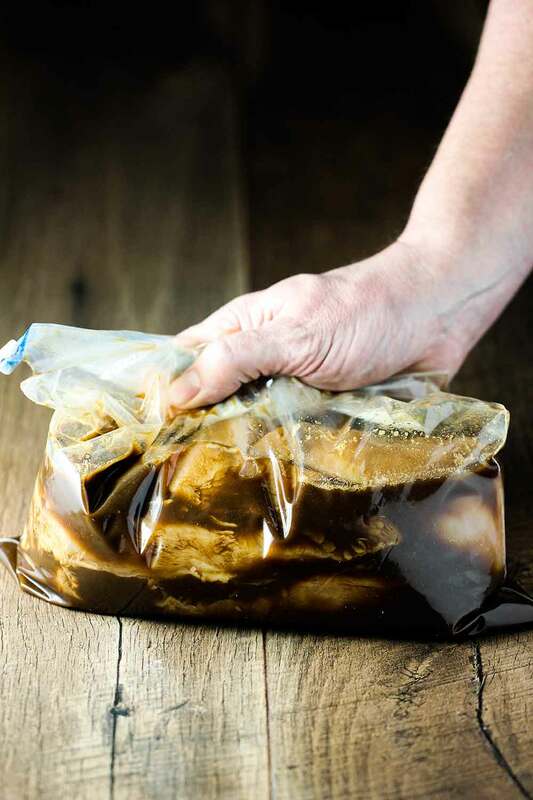 Close the baggie, or cover the dish with plastic wrap, and place in the refrigerator for 2 hours, or overnight. Turning a few times. Meanwhile, heat the olive oil in a large skillet over medium-hight heat. Add the onions and cook for about 10 minutes, until starting to soften. Add the soy sauce and cook for another 10 minutes, until starting to brown and caramelize. Set aside. Pre-heat your grill to medium-high heat. Remove the chicken from the marinade and discard the marinade. Sprinkle 1/4 cup of the rub all over the meat. Save any unused rub for another use. Grill the chicken (or sauté in a hot skillet) for 5 to 8 minutes on each side, or until an internal temperature reaches approx. 160°F. Remove from heat and let rest for 5 to 10 minutes. Meanwhile, cut the chicken diagonally across the grain into strips. Carefully add the cooked onions to the piping hot fajita pan (or skillet) and then add the chicken on top. 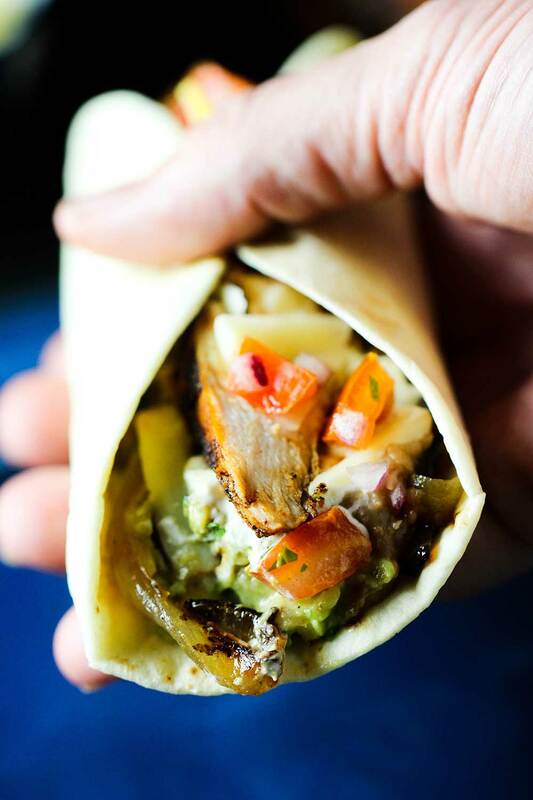 Bring the sizzling fajitas to the table and squeeze a lime wedge over the meat. Serve with warm tortillas and all the fixins. Maybe just me but I don’t see the link for the fajita pan! I think this is what I’ve been missing as a final step!